Critics say Coco Before Chanel, which comes out today, is an unusual biopic in that it focuses solely on who Coco Chanel was before she became famous. Some say it ends too soon, before revealing what made her a legend. Coco Before Chanel is a French film (with English subtitles) directed by Anne Fontaine, about the early life of Gabrielle "Coco" Chanel's formative years. As a child she is dropped off in an orphanage, then goes on to work in a bar. She becomes a seamstress to the performers and sings in there herself, and is nicknamed "Coco" after a song she sing with her sister (who is a composite of Chanel's sister and mother.) Her lover Baron Balsan introduces her to French society and she begins her fashion career by designing hats for his friends. Their relationship becomes complicated when she falls in love with English businessman Arthur Capel, and eventually she goes on to open her first dress-making studio. While some critics praised the film for delving into a little-known period of the designer's life, other said by ending before she becomes famous the film doesn't reveal what made Chanel unique. Tautou plays Chanel as harder woman than her previous characters, but some found her unsympathetic and Tautou too "winsome" for the role. However, in general, the performances are good and those with some interest in fashion are likely to find it entertaining, though uninformative. As such, the film, directed by Anne Fontaine (The Girl From Monaco), is not an expansive biopic but a fascinating snapshot of a pivotal chapter for Chanel, her formative fashionista years. Because it's more superficially stylish than profound, Coco leaves one wanting more - more of an in-depth examination of her complex nature, and more about the years when her simple designs captivated the fashion world. Still, the film, while scaled-down, is quite beautifully woven, like a classic Chanel tweed. Coco Before Chanel [is] a superior filmed biography that brings intelligence, restraint and style to what could have been a more standard treatment. The most obvious credit goes to the strong, sure performance of Tautou, who costarred in The Da Vinci Code following her breakthrough in the successful Amélie. Tautou not only resembles Chanel, she inhabits the role completely, using flashing eyes and a relentless intelligence to convey the unbending strength of a woman determined to make something of her life in a time and place when that was far from the norm. Judgments are not really on the movie's agenda. Rather than take a moralizing or pitying view of its characters, who live according to the social mores of their era and the logic of their desires, Ms. Fontaine examines them with curiosity and compassion. The result is an unusually vivid and convincing account of the historical past, composed in the present tense. Though its mood and methods are different, Coco Before Chanel shares with Jane Campion's Bright Star - another new anti-biopic - a fascination, at once intense and dispassionate, with the lives of women in earlier centuries. Coco and Fanny Brawne, the heroine of Ms. Campion's film, are not victims of oppression or paragons of resistance but rather individuals, made not of ideology or wishful thinking but of flesh and blood. There are a select few artists who can take the same materials used by everyone else and create a masterpiece. Coco Chanel was one of them. Director Anne Fontaine is not. Fontaine is a competent filmmaker, and Coco Before Chanel is a mildly entertaining period piece. What's missing, ironically enough, is a distinct sense of style.But though Tautou looks charming in her character's boyish outfits, her Coco is a demanding narcissist who draws minimal empathy. And despite some cutting and stitching here and there, we never learn what distinguished this woman from all the others who made their own clothes at the time. Of course, Tautou looks adorably chic in Chanel's clothes, with her petite, androgynous frame and big, brown eyes. Still, you wonder what moved her, aside from the simplicity of the men's outfits that would inspire her own suits and hats... Fontaine's camera glides smoothly, as if to invoke Chanel's perspective in assessing the fashions she sees around her. She goes through all the paces elegantly but never reaches out and grabs you. Certainly, focusing on the formative time in Chanel's life is preferable to a cursory, all-encompassing biopic. But Coco Before Chanel only starts to get interesting when she asserts her creative and financial freedom - and that's right when the movie's about to end. 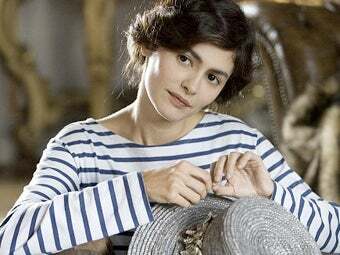 The problem for Audrey Tautou is that she is doomed to trail clouds of Amélie wherever she goes. Those inky round eyes and that pixie mug insure that hers are the features, poor thing, that social anthropologists will eternally reach for when asked to illustrate the term gamine. Or mignonne. She does her best to capture the sullen grit of the young Coco, and the sour distaste she felt for those off whom she sponged; but it's hard to jut your jaw when you don't have much of a jaw, just a perfectly rounded chin, and the adamantine hardness of Chanel-not just in her bone structure and bearing but in the elimination of all fuss from her couture and all wasteful palaver from her soul-is probably beyond an actress as winsome as Tautou. The ideal would have been Kristin Scott Thomas, twenty years ago. Maybe she could take over, should Fontaine decide to tell the rest of the tale. Those who love fashion will be intrigued by this, at least to a point, after which Coco Before Chanel starts to feel like witnessing a sponge at work in the act of absorption. That's not generally the stuff of compelling cinema. We prefer the end results of a personal education rather than the acquisition of it. If Project Runway were about the formation of the designers' sensibilities rather than the creative execution of that sensibility, would anyone watch? This automatically puts Fontaine's film at a disadvantage, and the truly enigmatic nature of her subject only compounds it. "You want, but you don't know what," Emilienne tells Coco, and the movie keeps us at that same remove. It may be too respectful of the legend it seeks to illuminate.